My most recent projects have been to participate in BattleBots in Long Beach over the weekend of August 14-15, 1999, and in San Francisco over the weekend of June 10-11, 2000. My 1999 entry was a "kilobot" (55lb and under, the lightest weight class at that event) named "Rott-bot" after my Rottweiler dogs; my 2000 entry was another lightweight, called "Rott-bot 2000". I was at BattleBots Las Vegas on November 17-19, 2000, with a new robot, Halo, but I didn't compete due to last-minute technical problems. I'm planning to take Halo to the San Francisco event in May 2001. 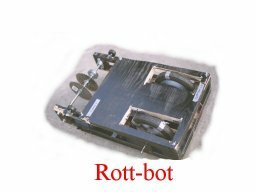 Comparison of Rott-bot and Rott-bot 2000 (including cost breakdown). Gear for Team Second Breakdown fans (other competitors may want to use this service). Speed controller design slides from a presentation given to the Homebrew Robotics Club. Jim Smentowski's very useful robot combat site. I've written and made available a Linux driver for the old B&W Connectix QuickCam. Details available here. I've been using Linux since 1994, starting with the 0.99.44 kernel on a 16MHz 386 machine. The only project I've done for publication is the QuickCam work (above), but as a Unix programmer, I find the Linux development environment very familiar and easy to use. I'm an amateur student of urban legends, and have made some small contributions to The AFU and Urban Legends Archive. I'm an infrequent contributor to the alt.folklore.urban newsgroup. See the Geocaching website for a full explanation of this hobby, which involves stashing "treasures" in the wilderness and publishing the coordinates of the location for others to find. I'm working on Palmable Geocaching web pages to carry cache listings around on my Visor, and I'm mapping where my invitation cards go. Rather than throwing away my old machines, I have them trying to find Mersenne primes. My main machine is an overclocked Celeron, which runs GIMPS when it's not being used for other work. I also have an AMD K6-II 450MHz (used as a cable modem IP Masquerade machine), and an AMD K6 200MHz. GIMPS is a good way to soak up spare cycles from a machine that isn't being used 24 hours/day. I use Gnu Privacy Guard for validation and encryption. My public key fingerprint is 3332 3E54 8408 C566 DFFC 4A0A 7D87 E382 1316 EDDC, and my public key is available on this web site.